The homeowners of Carbondale can rest easy knowing that John Fowler and his staff of professionals at 911 Restoration Southern Illinois are always standing by just in case any sort of water damage event takes place in your home. Statistically, a home may only experience one water damage situation in its lifetime, but that’s still one more than homeowners should ever have to deal with. This is why the Carbondale water extraction team is available 24/7/365 to tend to all your water disaster needs. Fortunately, for the people of Carbondale there is no water damage disaster that we can’t solve with ease. With all the latest technology at our disposal, such as air movers, industrial-grade dehumidifiers, powerful heaters and water pumping machines, the Carbondale flood mitigation pros can handle any water damage situation that you may encounter. The Carbondale water extraction techs know how damaging a flooding situation can be for a homeowner, which is why all of our crews are trained to get to you as quickly as possible. We have mobilized our entire operation so that they can be at the site of your water damage problem within 45 minutes of your call. Our Carbondale crews are prepared with an action plan for anything that happens, anywhere it occurs. 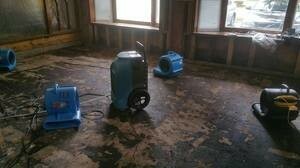 With expert training and an IICRC certification, we have the capacity to solve all degrees of water damage situations. The Carbondale flood mitigation agents understand that seconds matter when it comes to water damage, and getting to the site immediately can mean the difference between a small leak, and a major flood. To do this, just give our licensed, bonded and insured operation a call any time, day or night, so we can dispatch specialists to your emergency immediately. We know that the Carbondale flood mitigation agents need to take care of water problems quickly before both the damage and costs increase. Our crews aim to provide the highest level of customer service possible to help homeowners in every way during these tumultuous times. To make things easier, we conduct free home estimates as soon as we arrive on the property, so both parties understands what needs to be done right away. We even file the insurance paperwork for you during your time of need, making sure to stay available to answer any questions you may have about your claim. If your home is experiencing flooding, contact the water damage Carbondale extraction experts with 911 Restoration Southern Illinois, so we can get started immediately on giving you a fresh start today!